As the field of pro bono service continues to grow, companies increasingly identify pro bono programming as a critical element of their overall social impact objectives. Taproot Foundation conducted an inaugural survey of companies doing pro bono to collect data on their programs, identify trends, and share key observations for advancing the field. This resource provides information to help practitioners compare their program design and outcomes to peers in the field, and to support them as they work to effectively tell their success stories and achieve greater impact through pro bono service. 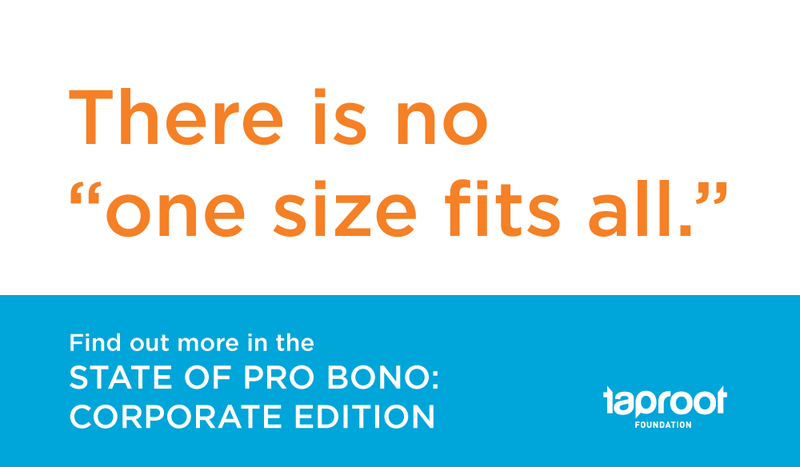 For all key takeaways and the full report–including data illustrating current trends in pro bono programming–download the State of Pro Bono: Corporate Edition.